Getting Robin set up to use her iPhone to post to our blog. You've heard the question asked, "what's the best camera?" and the response, "the one you have with you". When you're carrying the iPhone 4s in a LifeProof case it's hard to beat. 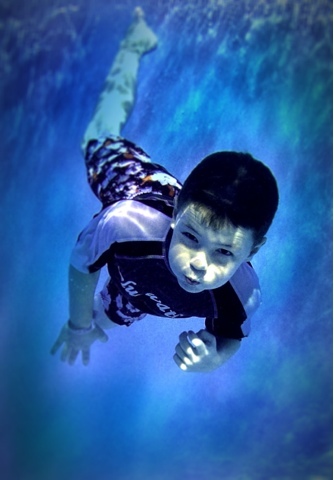 Case in point this picture of our grandson Trevor taken in the pool at the Neptune Inn on Fort Myers Beach. Been away from blogging for quite some time. Haven't felt the need. When you spend time on Facebook there doesn't seem to be the need for a blog, but oh well here we go.